Mary Senior will be along to speak about issues around the government’s ‘Prevent’ agenda, and we will also discuss workload issues as well getting updates from the committee. On Saturday 3 October the racists and Nazis of the Scottish Defence League (SDL) plan a protest to whip up racial hatred, Islamophobia and division around the issue of refugees and migrants. 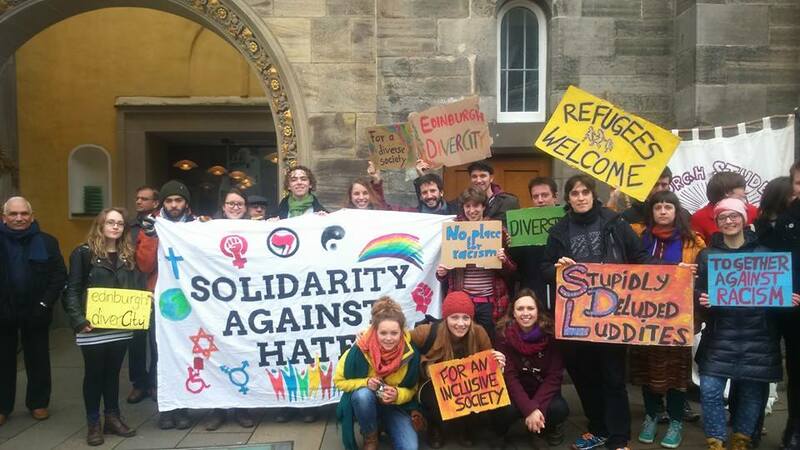 Edinburgh Against the Racist SDL have organised a march in opposition to this. For further details, see their Facebook event page. The STUC is supporting the TUC organised Rally and March against austerity and for workers rights on 4 October in Manchester. Edinburgh bus leaving from Advocates Close, Edinburgh EH1 1PS at 7.00 am for Manchester. Further details on the STUC website. The 2015-2016 Committee is a mix of old and new faces. Find out who’s who at Officers & Committee. We still have a number of vacancies for both officers and ordinary committee members. The Union is run by its members. If you think you’d like to get involved or just want to find out a bit more, please contact us.